A stately combination of French architecture and minimalistic décor, the Parisian theme is one of Ashley Stark-Kenner’s favorite styles. Below, Ashley describes what she likes about this room’s cultured look. “In this design, the French sensibility is evident in the juxtaposition of modern and traditional elements. 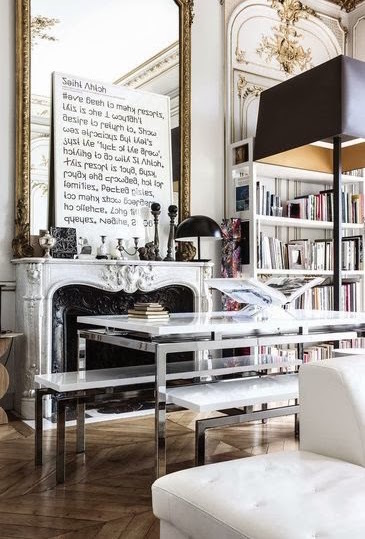 For instance, the clean, white lacquer bookcase expertly offsets the solidly traditional feel of the fireplace. The heavy molding, another hallmark of traditional design, provides a great contrast to the bright dining room table, shiny chrome lighting, and the ivory couch popping through in the corner.